When it get permit admission, the university will send us an admission notice and a visa application form JW202 (in case of self support study) by international mail. These documents are necessary for visa application. In addition, a schedule table up to school entry and school map are included with them, so confirm the schedule in advance. 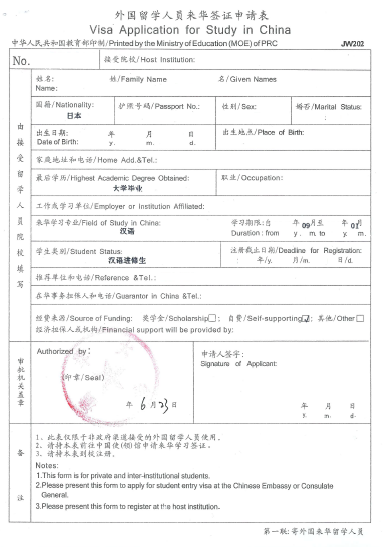 It is necessary to obtain a visa before entry to China. Usually the number of days required until issue is 4 working days. We will apply to the embassy in Tokyo or consular office that has jurisdiction over the address location, and the application fee is 3000 yen. Documents necessary for application are 1) passport and copy of photograph page, 2) JW 202 and copy, 3) admission notice and copy, and 4) picture of 4.8 × 3.3 cm. You can choose express application If you need to hurry. you can receive it on the afternoon of the next day you have applied. But you need pay extra 3000yen besides basic application fee 3000yen. It is going to be 6000 yen. In addition to those documents, we have to fill out another application form in the lobby of that day. (It takes about 5 minutes to complete) The form is placed in the application lobby. When we finish filling in the form, we go to the counter of application then entrust all documents to officer. If there is no deficiency, the visa application receipt, original admission notice, original JW 202 are returned and the application is over. Passport with visa attached will be returned in 4 working days after or next day. In the same place we can exchange to passport with attached X1 or X2 visa with application receipt. When we go to application, many people are also coming, so let's apply with spare time. *all prices are case of Japan.